Hydrotherapy has been shown to reduce aches and pains with a combination of powerful massage therapy and heat. Loaded with sixty six high-volume, sophisticated massage jets and seven seats, the Piper Glen certainly offers the ultimate spa experience. With five different controls for massage seats, everyone can relax with just the right amount of pressure without diverting water from other seats. Pumps are rated at brake horse power. Spa images have been digitally rendered and may or may not show optional features. Ground-breaking hydrotherapy jets deliver deep muscle penetration for an effective massage. The unique Helix design delivers an active massage even through static jets. The dashboard layout of spa controls makes it easy for users to control the spa while relaxing. Listen to the soothing sound of falling water while you relax with this beautiful waterfall. Platinum Elite Spas come standard with maintenance free cabinets that are more durable and lighter than wood. The Maximum Tapered ASTM Cover adds insulation value and protects your spa. Relax knowing your spa is being kept safe and insulated. The most progressive 7 step water management system combining Crystal AOP™ and FROG® @ease™ with SmartChlor™ technology. This Smart Titanium Thinktemp Heater fine tunes your spa to the perfect temperature, is corrosion resistance and provides long-term durability and reliability. 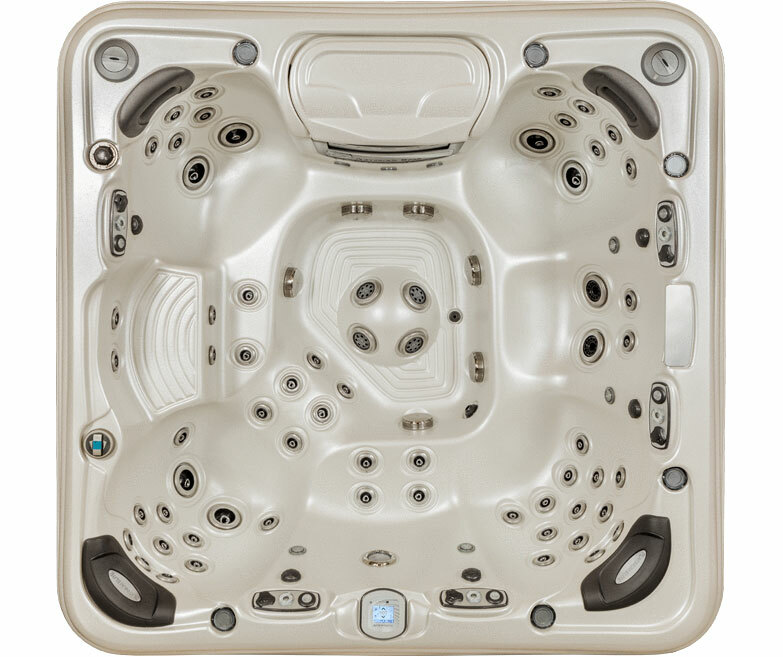 The Platinum Elite spas are perfectly fitted with a tough, rigid ABS thermoplastic base pan. Completely waterproof and weather resistant, this base protects your spa from the ground up. The addition of a beautiful LED lighting system to your spa illuminates the texture and detail of the spa’s interior, and the spa’s cabinet. Let warm water flow over your neck and shoulders with the pillowfall. Perfect for neck and shoulder pain. The standard Platinum Elite warranty comes standard with lifetime for structure, seven years for surface, five years for parts, labor, plumbing and electrical, three years on Morbern Cover Upholstry, and two years for Monarch Cabinets. Choose between the bba™ Bluetooth Audio System or the Premium Infinity® System by Harman.